CNG: The Coin Shop. CELTIC, Southern Gaul. Tolostates. Mid-late 2nd century BC. AR Drachm (12mm, 2.80 g, 5h). CELTIC, Southern Gaul. Tolostates. Mid-late 2nd century BC. 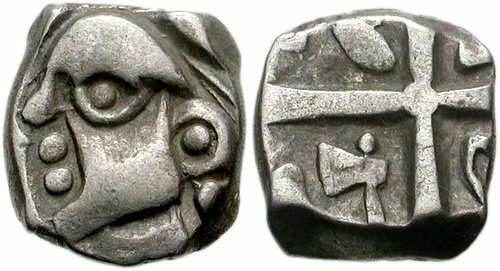 AR Drachm (12mm, 2.80 g, 5h). Celticized head left; two dolphins before / Quadripartite design; crescent in outer portion of each angle (off-flan); a diagonal grain within each upper angle; within lower angles, axe and open grain. Savès 1; CCCBM II 56-62; de la Tour 3132. VF. Well centered and struck.